Other than the aforementioned, it also does everything 5 years better because it's a new design. ...and that's 2 years better than the TNT, my logic is undeniable. All the boutique kites are good. Lam's are nice, Tim's are nice, Ken's are nice. It's all good. You can't go wrong with any of these. I have all I can fly so I'm good for kites. I loved the Nighthawk when I first got it but now that I've gotten the higher end kites, I can't remember the last time it came out of the bag. Lam's new kite will be just as high quality as his higher end kites so I'm sure it won't be a disappointment. Here is a picture from last weekends LC kite festival. I've been flying it every chance that I get - it has exceeded all my expectations. One word to sum it up would be FUN! I haven't enjoyed a new kite this much in a long long time. hey Tom: got any other pix from the festival? Sorry - too busy flying! I took my camera, but I was having soo much fun that I didn't take a single picture. This one was sent to me. I've been getting some emails asking about the Transformer (mostly about how it compares to the Fearless), so here is my take on it after having flown the kite for 6 hours or so. First, it is not just a smaller Fearless - this kite has its own distinct feel and style. The biggest difference from the Fearless is that it is less turtle oriented. It does all the same tricks with similar inputs, but the feel and style of them is different. It is smaller than the Fearless, but not all that much smaller - perhaps 7-8%. Its wingspan is just over 7'. I'm not sure this is the full story, however, since the Transformer "feels" much smaller than its actual decrease in size would suggest - perhaps because the cut of the sail is different, the keel is different, the bridle is different, etc - it's a whole new kite. You notice right away that this kite has a different shape than the Fearless does. It is more "squared off" for the lack of a better description - it spins and rotates about itself fast or slow, and you can really cook on it doing super-fast tricks if you want to. My son can comete and JL on it so fast that the kite looks like a burning ball of fire (he was flying a red one at the time!). But you can also go slow if you want to - it likes it both ways; its up to you. Like the Fearless, it is a very easy kite to trick, I think that people who prefer the SD to the Fearless might find this to be their next perfect kite. To me, it seems between the 2 - it has some of the properties of both the SD and Fearless, but trades what makes each of those kites unique for its own new style. 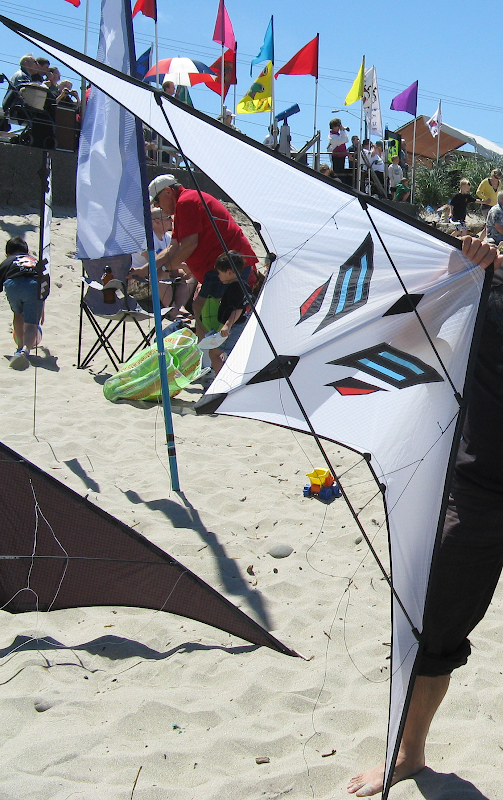 It is a very Agile kite - easy to maneuver, control, pitch, spin, trick, etc - this all makes its tons of fun on the lines. I've flown it on both short and long lines and it flys great on either. I've been having alot of fun with it on shorter lines (70-75') - great for flying in limited space. Precision is quite remarkable given its smaller size - you can cut nice shapes with ease - it locks onto a line very well. To me, it flys like a full size kite in this way (many smaller/mid size kites that I've flown are frankly just horrible at tracking a decent line, not this one). Even on short lines, due to its agility, you can cut some impressive figures. Even when the kite is rolled-up, you can cut nice shapes with a nice connection and feel of control. Some more general observations.....It makes some noise while flying - I like it - the sound punctuates what you are doing. You can bang flick flacks out very quickly - very few kites I've flown are this forgiving with this trick as this one - you can stop it early or late, it doesn't care (nice for working the flick flack into mad trick combos). It takes smaller inputs and has little pull - it flys pretty low (2.5 or so), but also higher without a dramatic speed increase which means it is fun to fly in both low and high wind. I was flying it in the low teens and having a ball - so little pull and so much fun I could have flown it all day in that wind. It is also easy to comete in low wind without having to back-peddle - it pitches around just fine and is easy to keep rotating. Rollups are tight and fast - and it flys very well while rolled. It also flatspins very well - nice flat 540s and slot machines. All in all, it tricks and flys amazingly well with no oddities that I noticed - it is an easy kite to just pickup the lines and start tricking. A group of us at LC that were flying the kite last weekend and someone said (I am paraphrasing here) that the Transformer is like a performance sports car with speed, handling, agility, and fun! I agree entirely. I should also mention the price - this kite goes for $350 for Icarex (less I think for Nylon). Considering how well it flys and that it is as well made as his other kites, that is one sweet deal. sounds like a great kite, when it doesnt have "eyes" or other graphic i dont care for i'll buy one and no a blank kite doesnt do it for me either. Don't you know that one of the reasons that his kites trick so well is because they keep an eye on you! I saw Lam and some others doing them - but this trick is still not very reliable for me on any kite just yet. I did get some pointers that will finally nail for me soon (I think). Update - I have the price wrong here. I said it was $325, but the price will actually be $350. The $325 price is for the first 10 kites. Well I'll get a chance to fly the Transformer tomorrow but the wind is supposed to be quite strong over the weekend. So I may not get a good feel for it. I'll try some Tazes.